The Mivida (mee vee duh) soil is Utah’s unofficial state soil. Although not legislatively established, the Mivida is listed by the Natural Resources Conservation Service (NRCS) as Utah’s representative soil. Soil is a complex product of (1) mechanical and chemical breakdown, erosion, and transport – by moving water, ice, or wind – of rocks and minerals (parent material), (2) leaching and deposition of chemicals and nutrients, and (3) organic growth and decomposition. Soils generally consist of 25% water, 25% air, 45% rock and mineral pieces, and 1-5% organic material. Aside from water and air, soil is our most important natural resource. Soil offers physical support, minerals, and a home for billions of microbes (mostly fungi and bacteria) that convert minerals to nutrients for crops. The Mivida soil is widespread across southeastern Utah; its parent material is sand derived from the lower Mesozoic sandstone so prevalent in southern Utah’s famous parks and monuments. According to the NRCS, the Mivida soil consists of fine sandy loam (mostly sand, with a small amount of silt and clay) that has a yellowish-red topsoil and pinkish-brown subsoil. It covers over 200,000 acres of rangeland, irrigated cropland, wildlife habitat, and recreational land on cuestas and benches in southeastern Utah. It forms in wind-deposited sheets of sand eroded from Quaternary (0 to 1.8 million years old) dunes and Mesozoic sandstone. 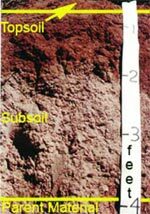 The soil is present at elevations between 5000 and 5400 feet. Precipitation of only 8 to 13 inches per year limits native vegetation to grasses, Mormon tea, saltbush, and sagebrush.